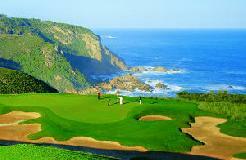 Knysna Golf Course is probably the only golf course in South Africa which can boast holes that are below sea level. When the course floods, which it does from time to time in winter, it is possible to canoe down the fairway on the 465-metre par-five 4th hole. 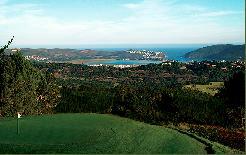 It is situated close to the famous and very beautiful Knysna Heads, as well as the Knysna Lagoon. It is easy to walk and a fun course to play but not championship standard. 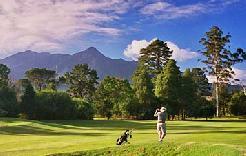 The Knysna Golf Club is situated on the eastern shores of the tranquil Knysna estuary one of the most beautiful regions of the Garden Route. 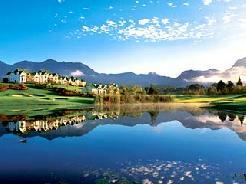 Set beside the shores of the Knysna Lagoon, the golf course meanders along tidal pools and magnificent indigenous trees. An interesting parklands style layout which has been enhanced over the past few years, offers excellent bent grass greens. 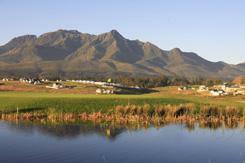 The 18 hole course emphasises accuracy rather than length. The level terrain makes the course appear deceptively easy but the layout provides a challenge to golfers of all standards. A unique feature of the course is that sea water is in play on 10 of the 18 holes. There is an abundance of birdlife - both sea and fresh water birds, raptors and forest birds. The chances are good that the golfer will see the richly coloured Knysna Loerie, undoubtedly one of South Africa's most beautiful birds. 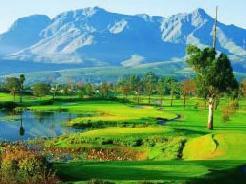 The pleasant temperate climate offers you golf throughout the year. Visitors are made most welcome by the friendly Knysna Club members. 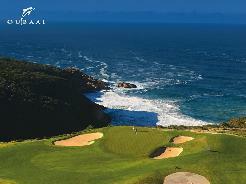 Signature Hole: The par-five 18th hole (was originally 9th but changed around in 2007) is the most formidable at Knysna. Although it only measures 435 metres, it channels through a wetland and golfers have to be wary of the reeds that flank both sides of the fairway.